Sixteen ships and more than 95 aircraft from the three countries are participating in the Malabar joint naval exercise. USS Shoup leaves harbour for Sea phase of Malabar joint naval exercise. 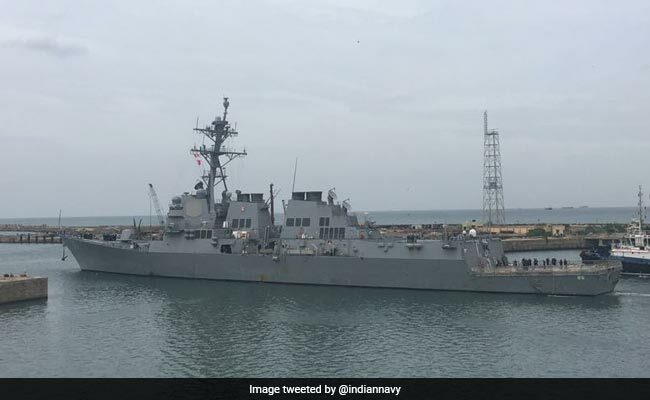 Chennai: Frontline warships and submarines of India, the US and Japan on Thursday sailed out from Chennai harbour to participate in the sea phase of the Malabar joint naval exercise at an undisclosed location in the Bay of Bengal, Navy officials said. Sixteen ships and more than 95 aircraft from the three countries are participating in the exercise. The sea phase would be held deep in the Bay of Bengal, the exact location of which has not been revealed. The annual Malabar exercise comes amid reports of Chinese warships prowling in the Indian Ocean Region in the name of anti-piracy operations, and Beijing's aggressive posturing in the South China Sea. The sea phase will see the ships, aircraft and submarines being divided into two teams - red and blue, and a war-like situation will be emulated, navy officials said. With two aircraft carriers - India's INS Vikramaditya, and US' USS Nimitz, and Japanese helicopter carrier JS Izumo participating, Aircraft Carrier operations and air defence are a key component of the exercise. The main focus however remains anti-submarine warfare. Both India and US have a submarine each, as well as Maritime Patrol and Anti-Submarine Warfare Aircraft P8-I from India and P-8A Poseidon aircraft from the US, as well helicopters on board the JS Izumo which are called the core of Japan's anti-submarine warfare. Air defence, surface warfare, visit board search and seizure (VBSS), search and rescue, joint manoeuvres and tactical procedures are to be a part of the war game. In addition, officials from the three countries will be flown onboard the ships at sea on July 15. The exercise will also witness a separate interaction between the Indian Navy and US Navy Special Forces and Explosive Ordnance Disposal teams at the Indian Navy's MARCOS training base INS Karna at Visakhapatnam. The harbour phase of the exercise started on July 10, and prior to that, a series of meetings and interactions between Indian and visiting Naval officials were held. China had last week expressed hope that the joint naval drill between India, Japan, and the US was not aimed at other countries.